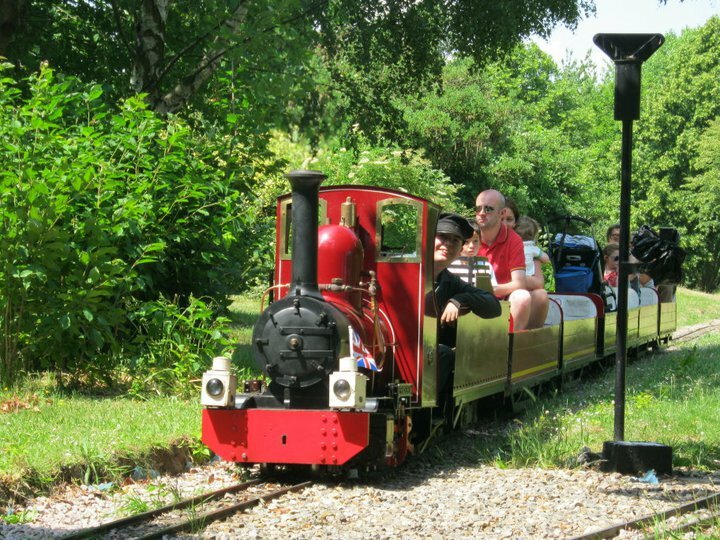 The SNBR is set in the picturesque Swanley park, which contains apart from the railway, a large family boating lake, sand pit, paddling pool, café, bouncy castle, kiddie electric bikes and an excellent play ground, all inside the 60 acre park. The railway however is not a pure pleasure line, with most of its custom coming from its primary function as a transportation service of visitors and there bulky luggage. The railway boasts a very demanding track, and although our trains on the flat are very powerful, the SNBR only normally run a standard 5 coach train, 4 coaches for passengers and 1 coach for luggage. The SNBR circuit is 1km in length (just over ½ mile in old money) and is notorious for its heavy and hard grades. Straight from leaving New Barn, the engine has to haul its train which can be anywhere up to 10tons in weight up the 1 in 80 gradient to the summit, before then descending down new barn bank at a ruling grade of 1 in 50 to Swanley Parkway, a careful hand on the brake, is needed to make sure the train stops at Swanley Parkway which is relatively flat by SNBR standards. After leaving Swanley Parkway the railway continues to fall at about 1 in 100 to what is known as cherry tree. This is the tree which is also the closest to the main running line. From here it’s a steady 1 in 100 all the way back to New Barn, hard work for any engine. The SNBR is also renowned for its fine collection of locomotives. The SNBR being a transportation service heavily relies on its diesel locomotives, which do the majority of the service trains, supported when drivers and locomotives are available from our Steam Engine Fleet. The SNBR fleet contains over 15 locomotives, with a large part of the fleet being constructed in-house by the society or its members.